Budapest creeps up on you. On the journey from the airport, as you pass through the grim Social realist architecture from the communist era, you are left with little other than a hint of the paint bill that Prague must have paid over the past seven years. But then, in the end you reach the Danube, across which the old capital of Buda was united with the market town of Pest in 1840, and you realise that this is a conquered city that got a better deal than the conquerors. Not that it has had an easy time. A double occupation during the second world war left most of the city and all of its nine bridges in ruins (same as Dublin until the 1970s, and remember how much wider the Danube is). But some of it survived, miraculously, the Opera House, a pocket version of the one in Vienna, much more beautiful for its intimate size. There was a cult of Elizabeth, the empress of the last century, which is best seen at the Godolla Royal Palace hall and hour from Budapest and Hungary’s third biggest attraction. Despite the destruction of two world wars, it is the palace most associated with the Hapsburg dynasty and was recently the venue for the 90th birthday party of Otto Van Bismarck, heir to the defunct throne and cousin of the man whose assassinating started World War 1. The house is now a shrine to Franz Joseph’s wife, Elisabeth (still remembered over a century later by her pet name Cissi), and a key to how her personality cult helped restore the good name of the Hapsburg dynasty in Hungary. Cissi’s box is still pointed out by guides at the Budapest opera House, an ornate construction which miraculously survived both world wars and is renowned for its claims to be a more beautiful Vienna and the ticket value (50 euros for the best seats, 30 euros for the rest, and the Gods for two euro). The season runs from September to May. Bus tours of the city concentrate their stops on the heights of old Buda where spectacular vistas of the city can be enjoyed. The Fisherman’s Bastion has a Gothic feel to it, the Statue of Liberty is a relic of the social realist Soviet era. In the cocoon of Old Buda, with plunging entrances to the chalk caves below, the remains of the old Medieval town can be admired, including a Plague Thanksgiving monument and the cathedral. Parliament house that sits on the Danube, that so inspired Arthur Griffith to found Sinn Fein, and where 200 democracy protesters were shot in 1956. .Hungary was the first Eastern European country where communism fell. The Russians were only the last in a long line who rolled over the country. The Romans were here, then the nomadic Magyars, from where the coronation of their king with a crown from the Vatican in 1000AD. The Mongols were next to come, and then the Ottomans from 1541 to 1668, whose Turkish baths are still found. The Austrians were next and after their 350 year stay, and the Germans and he Russians fought for the city in 1945, flattening 75pc of the city in the process. They once had a collection of their Hapsburg monuments, and now a Stalin and Lenin collection offers one of the most bizarre excursions in any European capital. . There are 23 wine regions in Hungary, and at vineyards such as Bachus in the east you can find there is more to Hungarian wine than Bull’s Blood. Goddola is a hunting area, near the Hungaroring when the 20 th of August each year sees the Grand Prix and 400,000 visitors mix in with the locals celebrating St Stephen’s Day (the local version, not the Christmas one). The drive to the countryside presents the speckles nature of the culture, the churches are Catholic, dressed in Byzantine. Inspired by Michael Flatley, the Experidance Group presents a breathlessly energetic trip back through Hungary’s thousand years of culture, a riverdance of Danubius. You have rampaging Magyars and Mongols, girating nuns, and marching world war one figures, Hussars, Cossacks, Hapsburgs and Magyars somersaulting in mock fights, as the theme of a Hungarian people and culture waking to overcome its adversity finally comes through. And then, in the late evening, it hits you like a bolt of lightning. The place celebrates adversity. On the wrong side in two world wars, and occupied by a despotic regime for over forty years it might have cause to complain. But it doesn’t. It celebrates the diversity, and instead of smashing all the Russian worker-hero statues it parked them all in a statue park where you can go and look and by tee-shirts and military memorabilia from the Soviet regime. Now why didn’t WE think of that? 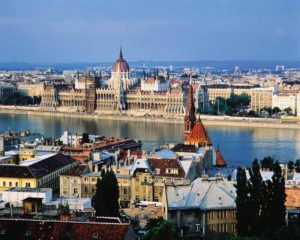 n Malev flies direct from Dublin to Budapest at 7.55am daily. The Hungarian Tourist Board have recently opened a Dublin office in the embassy in Fitzwilliam Square.